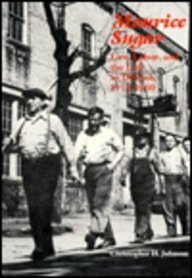 It was Maurice Sugar, labor activist and lawyer for the United Auto Workers, who played a key role in guiding the newly-formed union through the treacherous legal terrain obstructing its development in the 1930s. He orchestrated the injunction hearings on the Dodge Main strike and defended the legality of the sit-down tactic. As the UAW's General Council, he wrote the union's constitution in 1939, a model of democratic thinking. Sugar worked with George Addes, UAW Secretary-Treasurer, to nurture rank-and-file power. A founder of the National Lawyers' Guild, Sugar also served as a member of Detroit's Common Council at the head of a UAW "labor" ticket. By 1947, Sugar was embroiled in a struggle within the UAW that he feared would destroy the open structures he had helped to build. He found himself in opposition to Walter Reuther's bid to run the union. A long-time socialist, Sugar fell victim to mounting Cold War hysteria. When Reuther assumed control of the UAW, Sugar was summarily dismissed. Christopher Johnson chronicles the life of Maurice Sugar, from his roots in Michigan's Upper Peninsula, through his resistance with Eugene V. Debs to World War I, and on to the struggles of the early 1930s to bring the union message to Detroit. Firmly grounded on the historiography of the UAW, Johnson shows the importance of Sugar and the Left in laying the foundation for unionizing the auto industry in the pre-UAW days. He documents the work of the Left in building a Black-labor coalition in Detroit, the importance of anti-Communism in Reuther's rise to power, and the diminution of union democracy in the UAW brought about by the Cold War. Maurice Sugar represents a force in American life that bears recalling in these barren years of plant closings. Christopher H. Johnson is professor emeritus of history at Wayne State University. He has written on eighteenth and nineteenth century French history and is the author of Utopian Communism in France: Cabet and the Icarians, 1839-1851.